I could honestly care less about reviewing a direct to video Disney sequel, however, in this case, I want to make an exception. 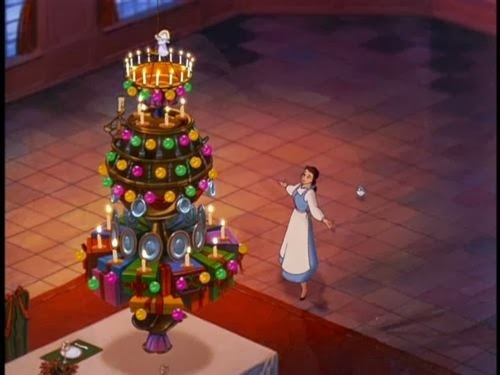 It is the Christmas season, and back in January I did start the year with a review of the 1991 Disney classic “Beauty and the Beast”, so it only seems fitting that I close the year with a review of its 1997 sequel titled “Beauty and the Beast: The Enchanted Christmas”. As you’d expect, this film follows suite with a long line of direct to video Disney sequels, which are commonly hated, and pore follow ups to their predecessors. This film in many ways is no exception, as it obviously doesn’t hold a candle to the original, but it’s also one of those films that I have something of a soft spot for. 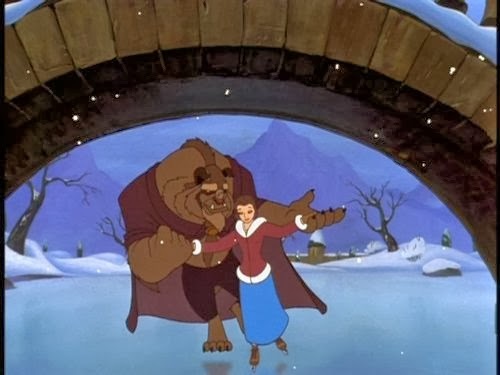 regrettably, I didn't grow up watching the original “Beauty and the Beast”, but I did have this squeal on home video, and as a result, it's mainly were my childhood nostalgia for the Disney Beauty and the Beast characters steams from. Even with my own personal nostalgia factor aside, I still think it’s at least better than most of the other forgettable Disney sequels, and has some worthwhile things to offer. In truth, having this movie themed around Christmas may seem random and out of place when compared to the original, but I honestly think it helps in this movies favor. 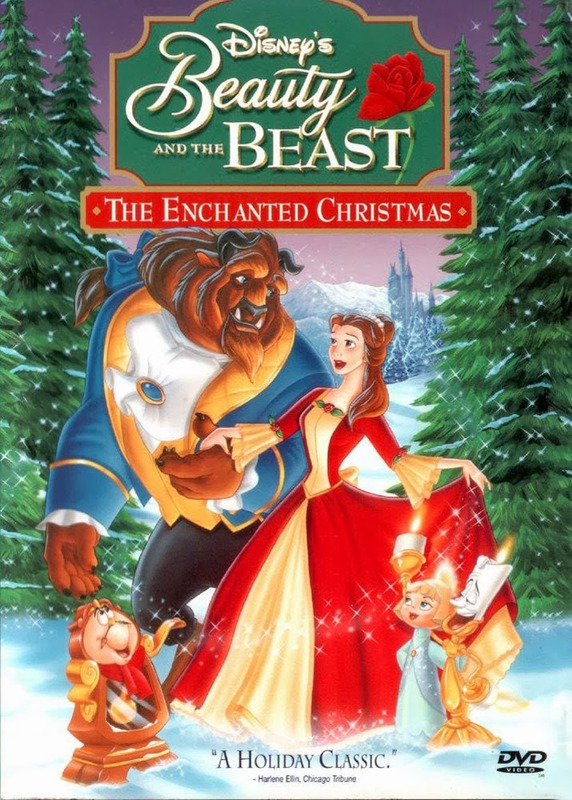 Most other direct to video Disney sequels are just empty follow-ups to classic movies (with some small exceptions), but this movie has some small chance to stand apart as its own thing with a subtle splash of Christmas magic. The film plays less like a sequel, and more like a prequel or in-between sequel, as the plot takes place somewhere in between the events of the first movie. 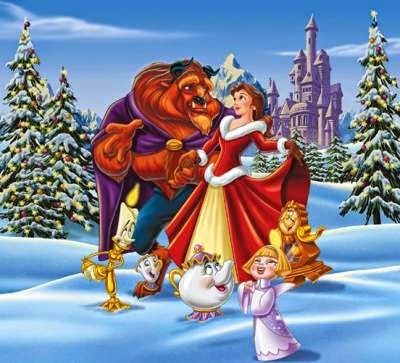 The story goes like this, it’s Christmas time at the castle and everyone is cheery, that is with the exception of the Beast who naturally can’t get into the spirit of the holiday. 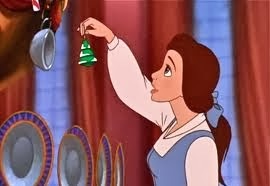 Now, it’s up to Belle and friends to get the Beast to see the real meaning and beauty of the holiday. Meanwhile, an evil villain aims to twist and cloud the beasts mind with misery and envy, all in hopes of preventing our two lead hero’s from falling in love. It’s about as generic as Disney plots go, and it sadly leaves the characters with little to do. 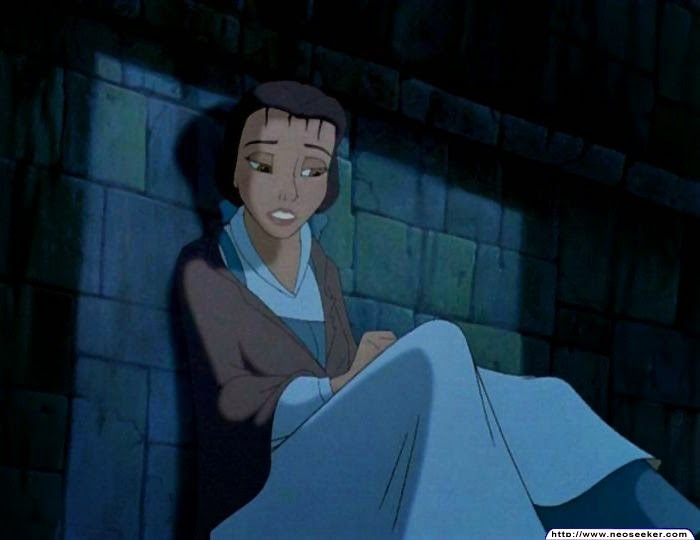 Belle is still a great leading heroine, but in this film she feels more like a stereotype that will obviously do the right thing, rather than a character with either personality or a multilayered arc. 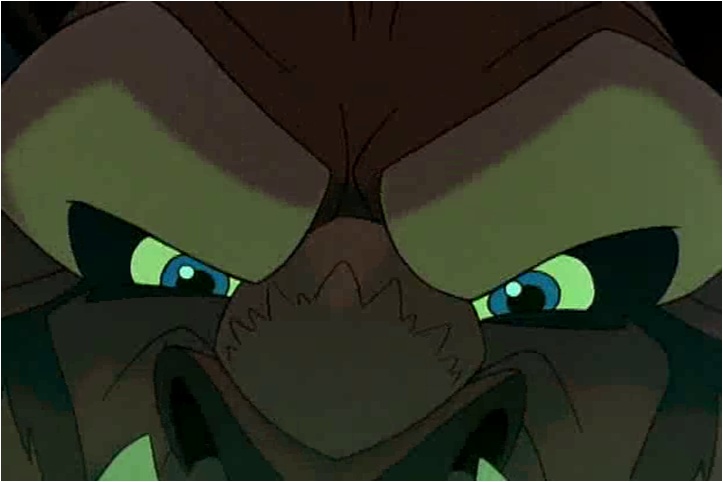 Things only get worse with the Beast, who’s clearly just a stereotypical Mr. Scrooge that will act bitter, grouchy, and then learn something meaningful in the end. Most of the primary supporting characters from the original are back and while they have little to do in the plot, they’re still just as charming as ever. 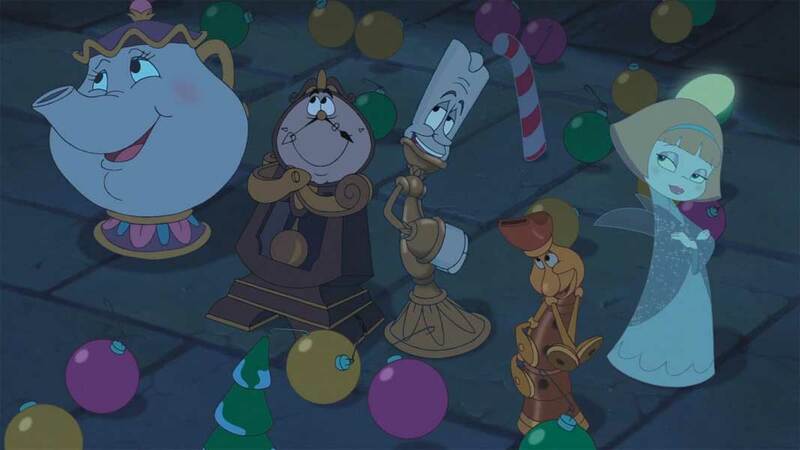 The enchanted Candle and Clock named Lumiere and Cogsworth are still fun to watch, and Angela Lansbury respectively reprises her role as Mrs. Potts, which is very welcome. 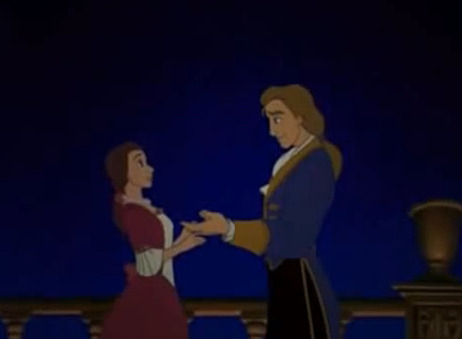 Belle’s father Maurice is given a small background cameo, but then again what else would you expect him to do. The only big cast change is the enchanted tie-cup Chip, who’s now voiced by Haley Joel Osment … someone often described as the greatest child actor of his generation. You may wonder why he’d waist his talents on a film like this, but on the contrary, he made a career out of doing voice work in Disney sequels. I’m not sure how many he did in total, but it was a tone of them. Then there’s some new characters that actually hold their own in the film. 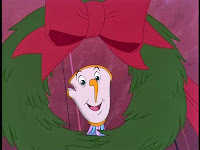 There’s a Christmas angle (by that I mean ornament) voiced by famous Broadway star Bernadette Peters and she has her own unique charm. Plus, it’s an instant highlight hearing her sing. There’s also an amusing little whistle character named Fife voiced by Paul Rubens, who’s the same talent famous for playing Pee Wee Herman. 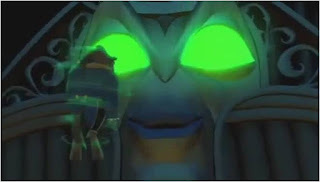 However, the best character, or perhaps I should say … the most entertaining character, is the villain Forte, voiced by Tim Curry. Do I need to say any more than that, I mean … it’s Tim Curry as an over the top cartoon villain, and he livens up everything. You could have the most passive, one dimensional character in the world, and he’ll still make the performance a lot of fun to watch. I especially love the design of this guy, as he’s basically a giant pipe organ with a scary face that reminds me of the face in the magic mirror from “Snow White and the Seven Dwarfs”. The animation on the character is great, and while he’s obviously CGI in a 2D setting, the effects are still cutting edge for the time. In fact, he just looks like something that should be CGI, and it’s also cool to have a villain that’s just towering over our heroes. It’s a good thing Forte is fun to watch, because his motivations are probably the stupidest I’ve ever heard. Namely, he doesn’t want the Beast and Belle to fall in love because that will break the enchantment and Forte refuses to become human again. 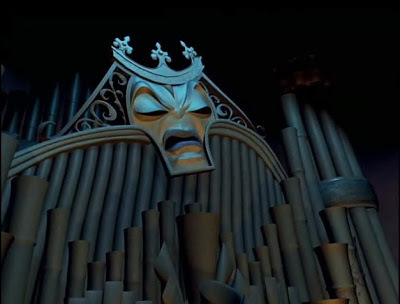 I guise he enjoys spending eternity as a piano that’s chained to a wall, and can’t even leave a single room. Seriously, why wouldn't he want to become human again? His villain song titled “Don’t Fall in Love” is perhaps the most boring and stereotypical villain song I’ve ever heard. Terrible lyrics, dull melody, and adds nothing to the story. Thankfully, Tim Curry still redeems the character by acting so deliciously over the top, especially during the climax, as he goes all out with wicked laughter and destructive magic spells. 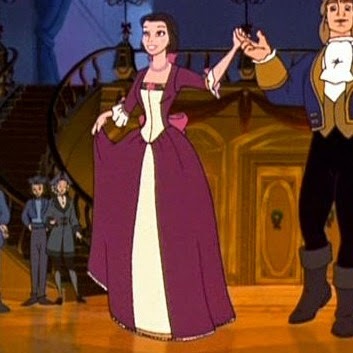 In comparison to the villain Gaston from the first “Beauty and the Beast”, Forte is a million times hammier. You could argue that Gaston was silly, but at least he had charisma, and even a subtle metaphor at the center. Forte on the other hand is just a goofy villain, yet while obviously not as well rounded as Gaston, I personally find Forte more fun to watch then his predecessor. The musical score in this film is quite nice to listen to, and the individual songs themselves range from surprisingly good, to unsurprisingly bland and generic. The movie begins with “Deck the Halls”, performed by a Chorus, and that dose a good job putting me in the proper Christmas mind set. There’s a song called “Stories”, which doesn’t really have anything to do with the holiday, but it has a nice melody, it’s up-beat, and the scene boasts some really nice animation. 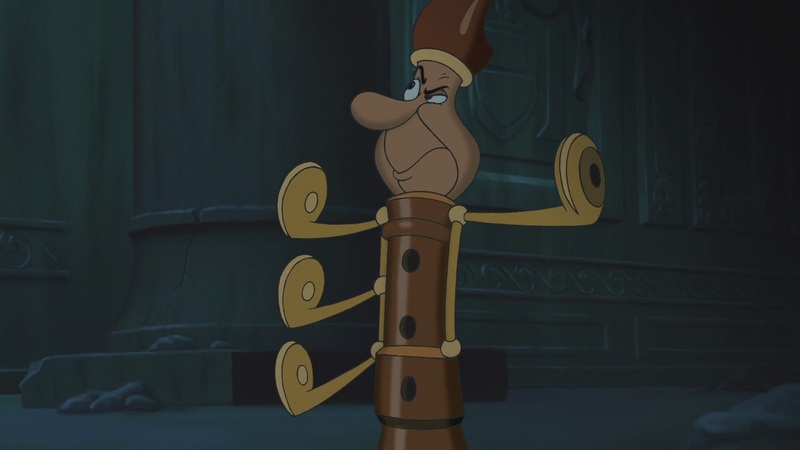 The weakest song is called “A Cut Above the Rest”, which is a buddy song for Lumiere and Cogsworth, which could have been passable, but the song itself comes out of no-where and it happens just before the climax. The big musical number of the film is “As Long As There's Christmas”, which I have mixed feelings about. 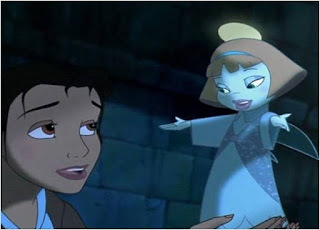 The version that plays during the movie is descent enough, it’s lively, colorful and active enough, but the lyrics are just a little silly at times, and you can’t help but feel that it’s just trying to be this movies “Be Our Guest”. The final version of this song performed by Peabo Bryson and Roberta Flack is really good, in fact this version of the song can easily stand on its own as a genuinely great Christmas song, and it’s one that I really love listening to every year. I know it isn’t fair to compare the animation of a direct to video movie to that of a theatrical motion picture, especially considering that one film has a much bigger budget then the other. In fact, I’ll go so far to say that the animation really isn’t that bad by direct to video standards, and there are some really nice winter visuals. However, there’s one glaring problem that needs to be addressed, especially in comparison to the first “Beauty and the Beast”. I stated in my review of the first film that despite being a story set almost entirely in a castle, it never once felt confined or claustrophobic. Everything was brought up on a grand scale, the backgrounds were beautifully detailed, and the surroundings all felt magical and lively. Unfortunately for this movie, it has very empty backgrounds, tight spaces, and less colorful interiors ... that is with the exception of the song numbers. 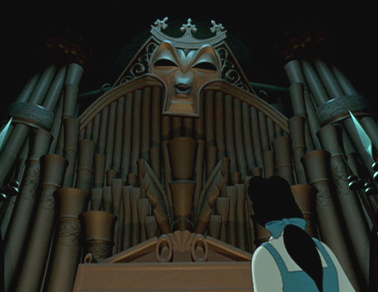 In fact, most of the interiors are dark, gloomy and the characters are mostly trapped in shadows. When you mix that with the films slightly harsh tone, and constant scenes that feature characters moping, it just makes this film feel empty and joyless at times. Oh, and when I say this film can be harsh, it can actually be really harsh. There’s a scene when Belle falls in a frozen lake, almost drowns and nearly freezes to death, which is immediately followed by a scene in which Beast locks Belle in a dark and gloomy dungeon while loudly stating that she’ll rot in there for the rest of her miserable life. I just don’t get this movie, I mean, didn’t anyone on the righting staff look at this, and think it might be a little too joyless. The movie tries to redeem itself by addressing virtues like “hope” and “forgiveness”, which to the films credit are done fairly well. Unfortunately, the story is just so passive and uneventful that viewers could probably care less. In the first movie, every scene was important and helped build on the story, but the scenes in this film come off as filler. 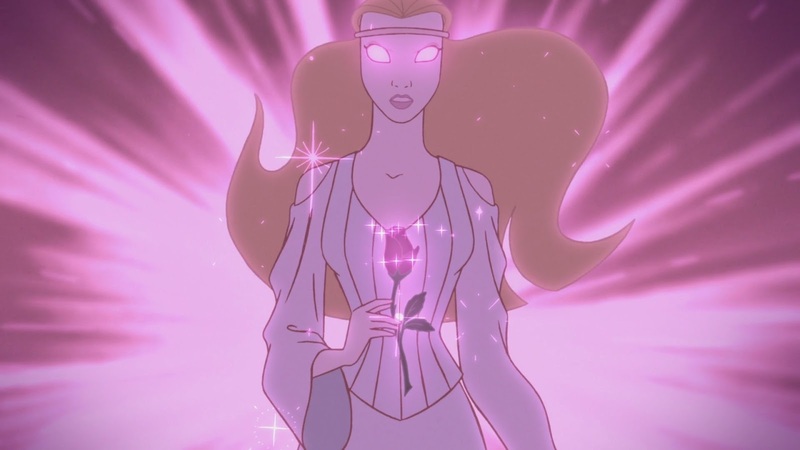 There's also a more detailed flashback of the spell that the enchantress unleashes on the castle, which is cool to see but it doesn't tell us anything that we didn't already know. The only knew information we get is that the enchantment was cased on Christmas, hence why the Beast hates the holiday. However, information like that is only at the convenience of this sequel and adds nothing to the first film. There just isn’t enough depth to either the story or characters to really justify its existence, but sense it’s here, I can still enjoy it for the select things I like. I do have the nostalgia for it, and it's something that I just can't help but look forward to watching now and then around the Christmas season. There really is still just enough of that classic Disney magic, and enough enjoyment that the film can pass as derivative. I will say that of all these really bad direct to video Disney sequels, I don’t think this one is entirely bad. It does have its good morals, some of the music is pleasant, the villain is a lot of fun to watch and there’s a hand full of genuine Christmas charms on display. This still isn’t a good movie by any means, and it doesn’t even touch on the brilliance of its predecessor, but at the very least, it’s slightly better than just another bland, or uninspired direct to video sequel. I give “Beauty and the Beast: The Enchanted Christmas” 2 ½ stars out of 5.